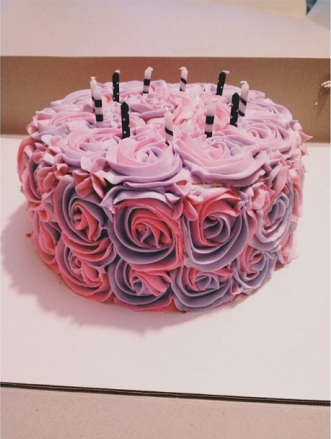 I made one of my best friends a cake for her 18th birthday yesterday – and she loved it! Yay! I just used french vanilla cake mix, and made three batches of Wilton’s Buttercream. And then I just took a piping tip, and piped some of the pink and some of the purple icing into the bag, and piped away! Just sort of went with it, I didn’t really have an exact plan.